I hope everyone had a wonderful Valentine's Day! My Valentine and I have been working really hard to finish a few projects around the house. On Sunday, I showed you the destruction that was my landing and my stairs (they still look like that... ugh!). I am so happy to announce that the landing is officially done. The project of the stairs will continue this week and this coming up weekend. Once we had cleaned up the landing from the carpet and staples (I despise that part), we had to add a bullnose to each one of the treads. 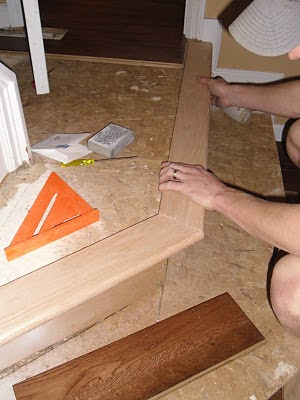 We secured the bullnose to each tread with both nails and construction adhesive. 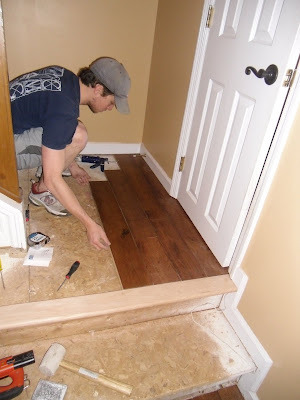 Hubs then added the hardwood to the landing. We used construction adhesive to secure the hardwood to the plywood subfloor. 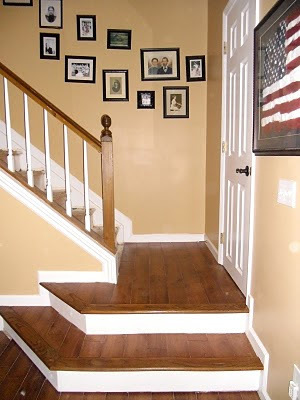 Side Note: When we added hardwood flooring on the main floor of our home, we made sure to buy extra, knowing that we would eventually have to do this landing and another two at the top of the stairs (these projects are on the "to do" list as well). 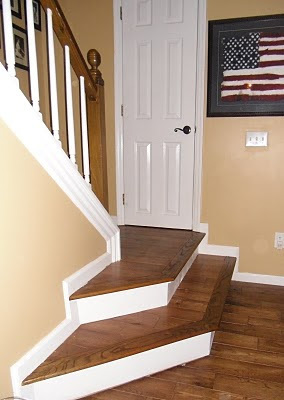 Once the landing was covered with the planks - we needed to match the color of each bullnose to the hardwood color. This was NOT an easy process. We could not find an exact stain match at our local home improvement stores - so we had to make one. I pulled out my collection of stains and started experimenting. It took me two frustrating hours of playing with several different colors of stain to come up with the right combination. 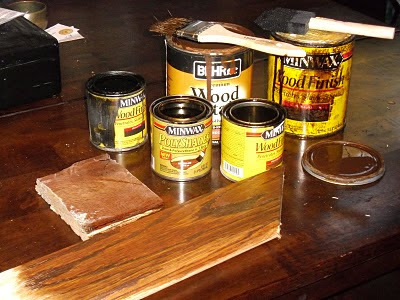 The right combo was a layer of Mahogany, two layers of Provincial, then a light wash of Ebony. Once each bullnose had time to dry, we added a coat of polyurethane to lock in the color. Finally, we painted the risers white and HOORAY we had the finished product! This project wasn't nearly as hard or time consuming as we thought it was going to be. We should have done this a LONG time ago! It looks so much better in my opinion. I am trying to convince Hubs to spring for those wrought iron balusters for the railings... we will see if that happens any time soon. HA! 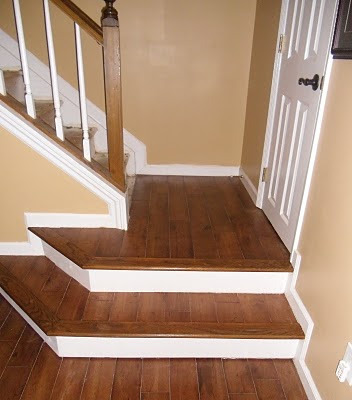 I will update you guys soon on refinishing the rest of the stairs. Talk soon, friends! Wow that looks amazing! I am so impressed! It looks great! Can't wait to see it all done--bet you can't either! Good thinking to buy extra wood. Come do mine....come do mine....Beautimus! I'm BACK... well tomorrow I will be.